Relax, Renew, Enjoy! Cape Cod Bike Path is adjacent - fabulous for biking and walking. Sophisticated, yet cozy ambiance. SeaChalet is truly a special peace of Cape Cod! 'Great Room' consisting of kitchen, eating, and living area leads out to large enclosed porch with heat/AC overlooking cascading fish pond. New gray TREX composite deck is set with inviting Adirondack chairs, surrounded by lush plantings. 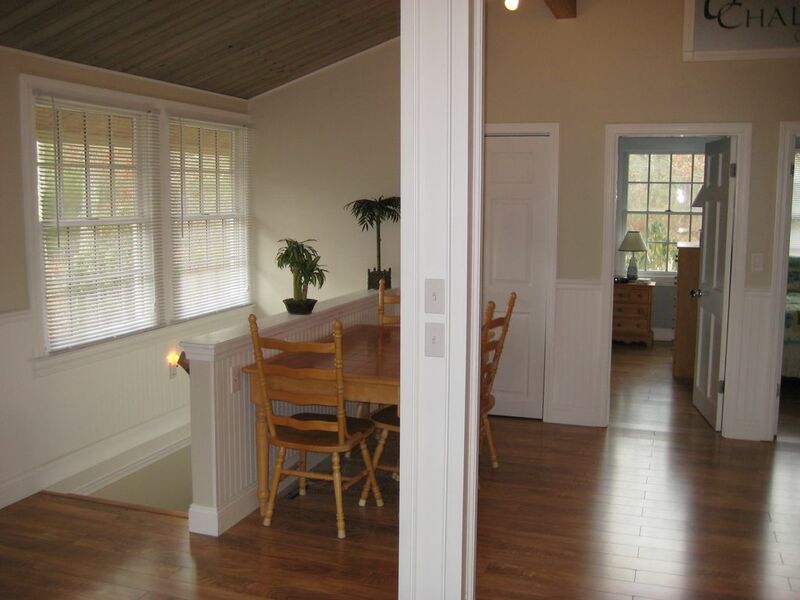 Bed and Bath Linens are included, and the home is one mile to Red River Beach on Nantucket Sound. We pride ourselves on our exceptionally clean and well maintained homes, and genuine, personal guest service. Want to vacation with another family yet have your own space? Please see our other home, 'Beach Heather'(Prop# 105619) located directly across the street. We own or handle the reservations for other homes in the neighborhood. Complete local concierge material available - let us know your special interests! We take great pride in our personalized, genuine guest service. Please take a moment to read our guest book - the link is located at the bottom of this page in Blue. Our guests say it better than we ever could ourselves. Please see our link to our website located at the very bottom of this listing - thank you! Sea Chalet is great. Sea Chalet is better than being home because of the care that the Bakers take with each guest they have. They never fail to provide loving care through the cleanliness of their homes, the thoughtful touches they provide upon your arrival, the wealth of local information, and the unfailing willingness to help ensure that your stay is 'all good'. This wasn't our first stay with the Bakers and hopefully will not be the last! outdoor shower, Enjoy a Cape Cod Tradition! Child's High Chair, Booster Chair, double Graco stroller, umbrella are available with advance request. Pack-n-Play Crib available with advance request. Baby items are complimentary, please let me know what items you will need when making your reservation. We stayed over New Years. The home was comfortable and perfect for needed R&R. Weather was outstanding! Walks on the beach daily! The house was great! Like new throughout and super clean! Very roomy for our group of five. The decor was Beachie and wonderful! A great entertaining house! We were here at Christmas so we weren’t able to use the decks and the backyard with the fire pit. But we look forward to coming back in the summer when we can use all the outside amenities as well. First impressions of the property were that it was very clean and actually bigger than the photos had made it look. It was very cosy, with lots of different places to chill. The children loved the koi fish and looked forward to feeding them each day. We were very happy with this property, the owner was very responsive when we messaged him and we had no problems here at all. We highly recommend this property, which as I said is even better than in the photos, the only downside is that you will be sad to say goodbye when you leave! Clean and light and airy. Sea Chalet is a beautiful home away from home.Joe has provided everything you could possibly need and always answered every question I had. The koi pond is a great addition and it was fun to feed them each day. The house was immaculate and the decor lovely.We highly suggest you book here! Really enjoyed staying here, House was nice and clean. We fed the fish outside everyday and was able to go all over cape cod from Harwich. There is also a beach just down the end of the street. Harwich is near the 'elbow' of the Cape - halfway between the Cape Cod Canal and Provincetown. This getaway is minutes from shopping, attractions and restaurants. If you call to inquire about this vacation home, please mention 'SeaChalet' - thank you!